Nostalgia In Miniature Workshops: Some Super Creations And Lovely Feedback! These past few days we have both been thrilled with the feedback from many of the 20 ladies who attended our first "Over The Little Garden Fence Workshop" last Sunday. We have received comments such as "Lovely afternoon, clear instructions and easy to follow", "Nice to meet new people, very friendly facilitators!" and "Great, I have never done this before but really achieved something." We have also received some super photos of some of the completed creations and with the creators permission, we are delighted to be able to show you two of these completed little gardens here now. 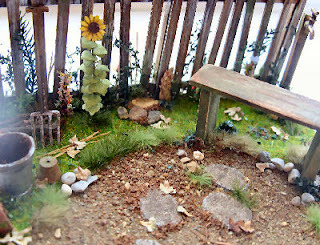 The images above are of Karen Holt's gorgeous 1/24th scale garden and she says "I am delighted with the finished project." 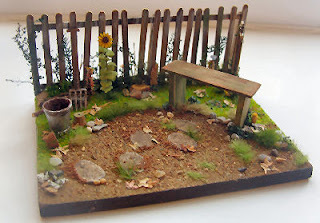 We love the way Karen has constructed her fence with some wonky uprights, added some of her own personal ideas and touches such as the sunflower, and has captured a real sense of a vintage country garden with her delightful little plot. 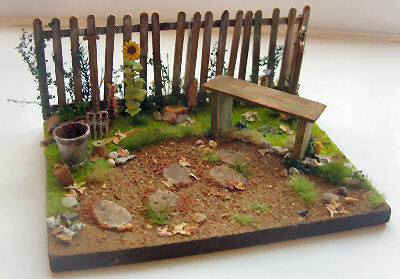 These next two photos are of the little 1/24th scale garden made by Jennie Moss and her interpretation of the same little project is different again, ...in fact Jennie's fence is in even more of a state of disrepair, including a broken upright! As with Karen's garden, we love how Jennie has added her own personal touches to her little patch and we think that the photos of this little garden are guarenteed to make you smile as included are two of Robins little creations plus a cockerel. We would both like to say a BIG THANK YOU to both Karen and Jennie for allowing us to show their exquisite creations on here. If any of the other ladies who attended the workshop last Sunday would like to show us their completed garden, please don't hesitate to forward your pics to either of us, we would love to see them....our contact details are on the website.